Oh my gosh – I have slept in! This is rare occurrence and what is even more unusual is that my alarm work me….I pride myself on being able to wake up just before the alarm so I never have the jolt of beep beep beep! However, this morning I was dreaming “I don’t want to wake up…I’m too tired!” and sure enough then came the dreaded noise. I now feel like I have a brick necklace on and really want to lay down my head! Either of these will do! I love the use of a modern fabrics to update this classic, timeless bedhead style! 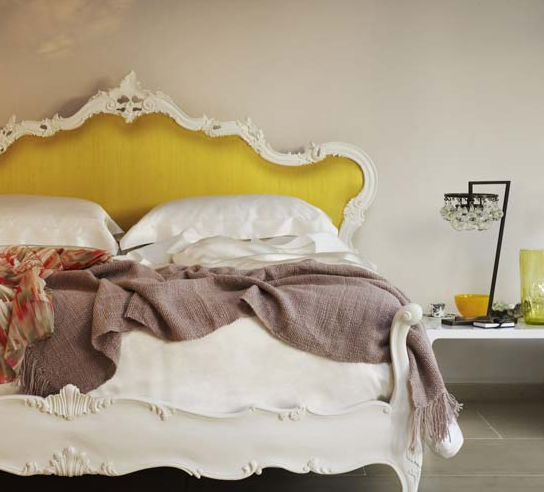 Choose all one colour to give the room a pop- try texture too like this gorgeous satin look. 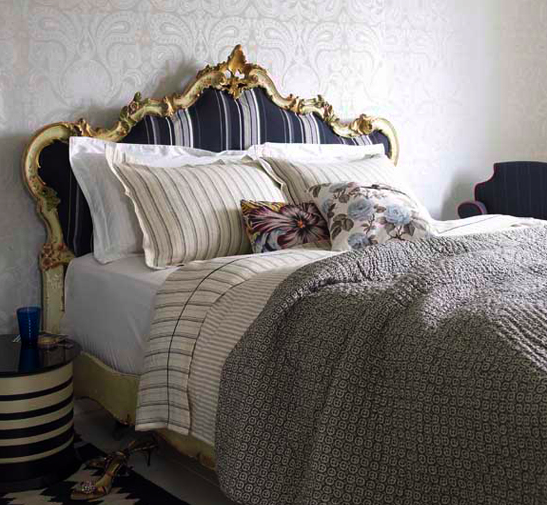 The wonderful thing about a strong bold stripe is it adds a mascualine touch – which is always important yet sometimes hard to achieve in a couples room. Notice the brilliant use of layers of patterns in the first image, the wallpaper, the bedhead, the bed linen, the cushions and the throw- this is how to do winter layered beds!! Snuggle up! What colours do you think are best for winter beds? ?